Although I work with video I do not consider myself primarily a video artist. Video is just one medium I utilize to create installations. The making of the work, the process, is based on experimental situations. I create scenarios, open-ended structures, for performances to be executed by specific people. 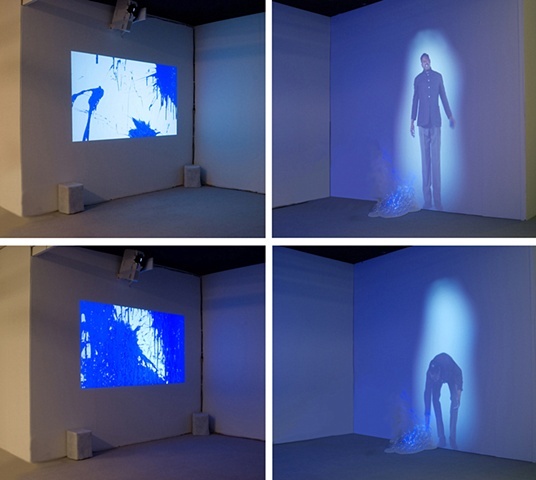 These performances are filmed with a static camera and projected unedited (other than the looping point) in conjunction with other spatial elements as installation. Installing the work, I am concerned with how it interacts with the space and the viewer, creating a situation that envelops and addresses the viewer, a scenario that is physically, emotionally and intellectually charged. I think about how the viewer moves through the work and how this effects the reception of the piece. I work with performers who aren't professional actors. I select them for qualities I have seen in them, so rather than asking them to act, I ask them to be themselves within the construct I created for them. The goal is to achieve authentic performances and emotions by creating an authentic situation. I work with what they give me in the instance of the performance, giving up control when it comes to the filming of the piece, which is done in one full take, presented unedited and essentially a documentation of the performance. The performers, whom I consider collaborators, in turn allow me to recontextualize them in the final product, the installation. Specifically it is this gap, this loss of control on both sides, that I am interested in, it is a moment that escapes artificiality.